My backyard garden this year is… bountiful. Overflowing. Abundant. That’s putting it poetically, of course—what I really mean is that I have more green vegetables than I could possibly eat even if I was a rabbit or Gwyneth Paltrow. Thankfully, I’ve landed on a little secret, and I’ll let you in on it, too: You can make pesto out of all of it. Everything. All the green things. Seriously. I’ve made pesto with chard. I’ve made pesto with spinach. I’ve made pesto with kale and carrot tops and arugula-I-accidentally-let-flower that was so bitter I thought was unsalvageable. Of course, I’ve also made pesto with basil, and that’s good too. But after all this pesto experimentation, I’ve actually come to prefer what I affectionately call Garbage Pesto. 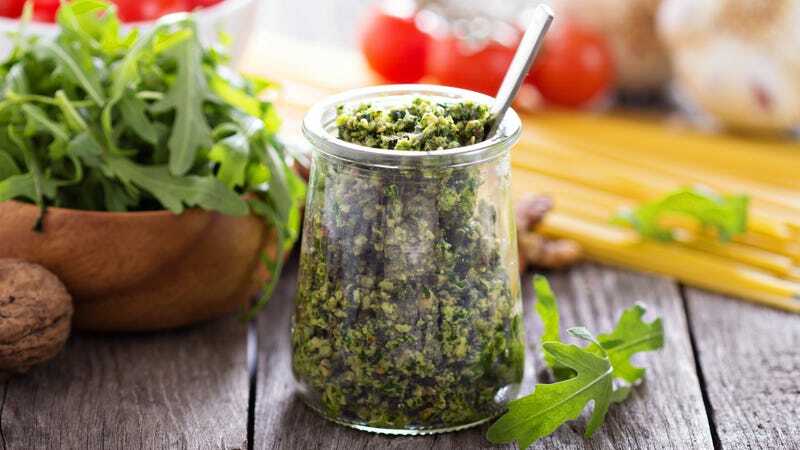 Garbage Pesto is pesto made with whatever chlorophyll-full, leafy veggies you have on hand: chard, kale, arugula, carrot tops, beet greens, spinach, basil, etc. I like it for its fresh, just-shy-of-bitter flavor, which tastes lighter and less unctuous than the standard basil-and-pine-nut pesto. Oh, and that’s another great aspect of Garbage Pesto: You don’t need pine nuts. Whatever nuts or even seeds you have on hand in your pantry works—walnuts, sunflower seeds, heck, throw some almonds in there. All you need to make Garbage Pesto is the magic ratio of two cups green stuff to one cup of olive oil to a half cup of nutty stuff and a half cup of cheese. I recommend combining the odds and ends in your fridge to achieve those ratios, so you’ll see that in my platonic ideal of Junk Pesto below, I’ve combined kale, chard, arugula and basil, as well as walnuts and sunflower seeds. Once you’ve made your magic Garbage Pesto, spread it on pizza and sandwiches; use it as a sauce for pasta; just dunk some nice bread in it. Voila. Add all ingredients except for olive oil, salt, and pepper to a food processor. Turn it on and slowly pour in the olive oil as the blade is running. Once olive oil is incorporated, turn off the food processor and taste your pesto. Season with salt and pepper, adding more cheese or olive oil if it tastes too bitter.